Romhacking.net - Hacks - The All New? Punch-Out!! 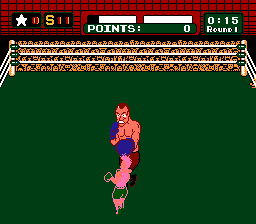 This is a hack which replaces the opponents with characters from other games including the arcade version of Punch-out, Super Punch-out, among other games. The referee has been replaced by Wario and the floor tarp has been recolored. The text has been modified to reflect the new content. 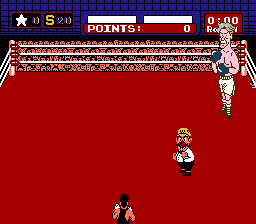 Little Mac’s trainer has been replaced by Von Kaiser. 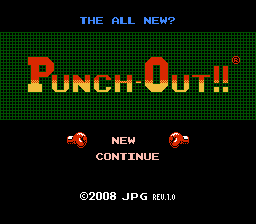 This hack is based off a trailer called “Team Awesome´s Punch-Out!! Trailer”. 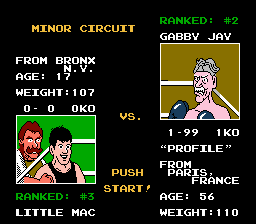 Gabby Jay - From Super Punchout!! Pete Pasta - The younger brother of Pizza Pasta from the arcade Punch-Out!!. Aran Ryan - From Super Punch-Out!!. Heike Kagero - From Super Punch-Out!! King Hippo - Recolored to become T.V. Hippo inspired by King Hippos appearence in the “Captain N: Gamemaster” cartoon show. Alyn Tendo - An original character related to Power Punch II. Mask X - From Arm Wrestling, an arcade spinoff of Punch-out!! Unmasked version of Masked Muscle - Super Punch-Out!! Al Molblin - Inspired by the Molblin/Moblin enemy character from The Legend of Zelda series. Frank Jr. - Purple Frankenstein monster from Arm Wrestling, an arcade spinoff of Punch-out!! 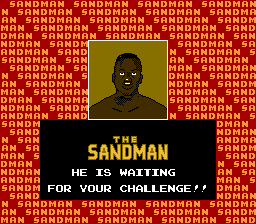 Sandman - Mr. Sandman’s son. As some people have been selling the game on repro carts without permission of the original author or compensating him for his efforts the author wishes to state that he is in opposition of such sales and that he wants the ROM to always remain free. The full disclaimer is found in the download.